For decades they called him “The Iron Guru.” For a few cherished years in the 1980s, I simply called him “Vince.” A new book by Karl Coyne, appropriately titled Vince’s Secret Locker, is the most ambitious and thorough compilation of what made the late Vince Gironda one of, if not the most influential and significant bodybuilding experts in history. Gironda trained thousands in his Studio City, Calif. gym across six decades, but millions of followers could never experience the inner workings of Vince’s genius — until now. 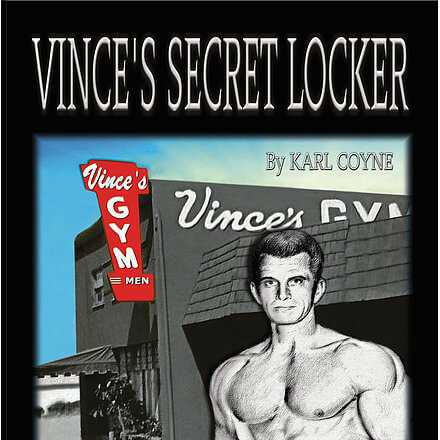 Coyne’s book takes the reader inside that small gym on Ventura Boulevard and taps into the training secrets, nutritional wisdom, philosophy and charisma that made Vince’s Gym a bodybuilding mecca. Make no mistake, however. While this epic 425-page Volume One details the secrets that forged world-class bodybuilders, Vince’s knowledge of nutrition, physiology and lifestyle compiled in this book will be an asset to the average person who simply wants natural, time-tested and innovative ways to reach maximum physical and mental potential, even if bodybuilding is the furthest thing from their mind. Through careful documentation of Vince’s own newsletters and writing, plus interviews with scores of bodybuilding icons trained by Vince, (as well as some of the just plain regular folks who made it to Vince’s,) Coyne successfully transports the reader to the gym floor of the windowless, intensely focused, legendary Vince’s Gym and into the magical mind of Vince himself. It’s a journey to a steroid-free mentality when titans carved muscles of steel using only the “magic wands” of iron and free weights. Vince not only changed bodies. He changed minds. “No pool. No chrome. No music. Just iron.” That was the (accurate) slogan printed on plain gray T-shirts at Vince’s. I discovered Vince’s in the 1980s when the specter of Spandex, aerobics and Olivia Newton-John’s booty anthem, “Let’s Get Physical”, was driving the masses to flashy, beat-pounding, air-conditioned, meat-market mega-gyms. After nearly a decade of working only on my studio tan in the recording industry, (yes, Frank Zappa “borrowed” that for a title,) I felt it was time to get in shape. Places like “24-Hour Fitness” and “LA Workout” were opening at a crazy pace, taking ridiculous sign-up fees, then failing in a couple months leaving members out hundreds. I wanted a gym that had been around for a while. I opened the yellow pages and boy, did I find it. I called Vince’s. After the fourth or fifth question the line went silent. “Hello? Hell-o-o-o?” Nothing. I called back. No answer. I called again, figuring I must have misdialed. “What do you want now?” was the answer. “Uh, are you open right now?” I asked. “I’m talking to ya, aren’t I?” the voice said. “You wanna join, come in.” Click. I was sold. Vince’s is a state of mind. Coyne’s book won’t physically take you to that world of worn red carpet, leather-padded benches, pinewood paneled walls with mirrors, mirrors, mirrors. You won’t be able to touch the rows of hot iron dumbbells lining the east wall or the arsenal of chrome barbells on the south wall. You won’t see the scores of pictures of greats who have passed through the gym seeking Vince’s tutelage nor stand in the light washing down from the single large skylight nor will you hear the quiet, deep grunts and breaths of other gym members. But your mind will “get it.” Go deep enough into Coyne’s compilation and you’ll get there. I wasn’t what Vince called a “physically genetic superior.” That was a term relegated to the giants who came through the door, — the likes of Arnold, Steve Reeves, Lou Ferrigno, Mohamed Makkawy, Larry Scott, Frank Zane — Mr. Universes and bodybuilding legends. But Vince and I struck a friendship. I was religious about going to the gym early each morning. And one day Vince told me to go to a (pre-Starbucks) coffee place on Magnolia Blvd. to get him a latte. “Told,” not “asked.” He didn’t even offer coffee money. But what I got in return was priceless. The Genius of Gironda. Vince forgot more than most geniuses ever knew about physiology, nutrition, energy, muscle-building and mental imaging. Example: There we were in the anti-egg ‘80s and Vince was telling students to eat dozens of fertile eggs a week in a smoothie with raw cream. “The yolk has balanced lecithin to metabolize the cholesterol in the egg.” It would be decades before modern science pardoned the egg and removed it from the “banished” list. Vince lectured me on kundalini and the importance of energy flow. Every word was a gem. And now much of it is in available to those who missed it. Coyne astutely lets Vince’s words themselves grace the pages. Readers are enlightened less by the musings of Vince’s former students and more by the mind of the Master himself. For those of us who knew Vince, Coyne’s book is an affirmation. For those who never had the opportunity, it’s a godsend. Hidden in plain sight are the newsletters, dialogs, descriptions, allusions, revelations, programs, methodology of the intuitive master who coached and trained the biggest stars in the field of bodybuilding and the greatest successes in Hollywood. Ferrigno to Clint Eastwood, Kay Baxter to Cher, Mr. T to Denzel, Gary Busey to Johnny Carson to David Lee Roth, Arnold to Tommy Chong. They all came through Vince’s and they all got the wisdom of the Iron Guru. Now you can, too. Even if all you want to do is be healthy, it’s the book for you.